I arrived at Kawatabi Elementary School in Miyagi Prefecture in the afternoon after regular school hours, so I did not have the opportunity to meet most of the students. The school was established in 1873, and it now has about 200 students. I chatted with the principal for some time about the school and its Blue-eyed Doll received in 1927. 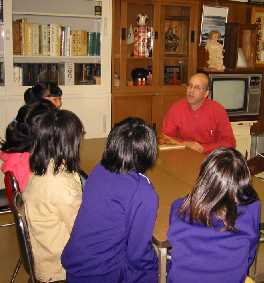 The students were involved in club activities when I arrived, so I had an enjoyable talk for about an hour with ten sixth-grade girls in one of the clubs. They had fun making a puzzle of US states that I had brought. 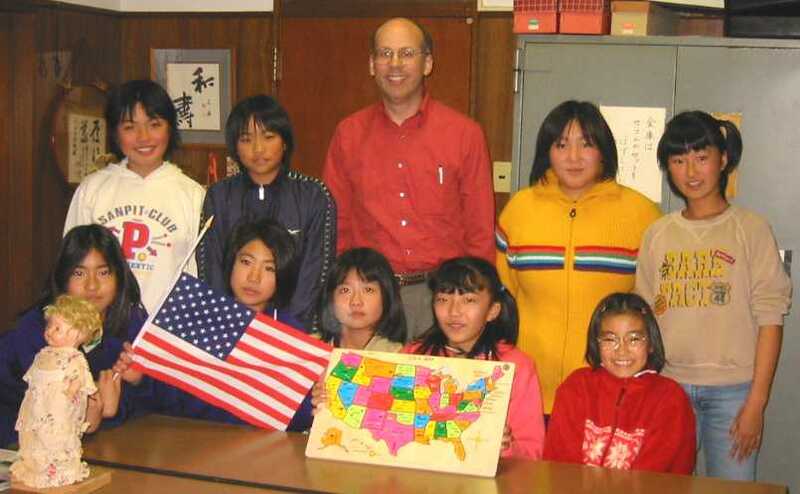 Although the manufacturer says the puzzle is for children from four to seven years of age, the sixth graders had quite a challenge with no familiarity of American states, with the names written in English rather than Japanese, and with no outlines of the states to guide them. However, working together as a team, they completed it in about ten minutes. Kawatabi Elementary School realized only this year that it had one of the Blue-eyed Dolls sent by America 74 years ago. The doll named Helen Jane Hayes had been kept with other items in a large display case in the principal's office for many years, but the school principal and teachers did not realize until recently the source of the doll. As I was about ready to leave, the girls I had talked to earlier popped into the principal's office. They presented me with origami cranes that could be placed on a "pond" they had made from cardboard and colored paper. I was surprised they made such a nice present in the short period of time after our talk. My visit to Kawatabi Elementary School was made possible by Ms. Tomoko Shizukuishi, who is shown in the photo at left together with Kawatabi's doll. She is an active member of the Miyagi Blue-eyed Doll Group. Originally I planned to visit three schools in Miyagi Prefecture, but Ms. Shizukuishi kindly arranged for me to visit two additional schools, prepared a detailed schedule for the visits to all five schools, drove me or accompanied me to each of the schools, and set up a special meeting at the Sendai Historical Museum to talk with the members of the Miyagi Blue-eyed Doll Study Group. All of her assistance is greatly appreciated!